WARWICK, R.I. (AP) — By the numbers, Rhode Island Gov. Gina Raimondo should be sitting pretty in her bid for a second term. She’s a Democrat in a state where Republican President Donald Trump remains unpopular after losing 54-39 percent in 2016. She’s a woman in a year when a record number of female candidates are generating excitement around the country. And her campaign has raised $7 million, seven times her closest rival. But a lot of voters aren’t sold, and Raimondo looks to be heading into a tough re-election fight. She faces a spirited, though poorly funded, challenge from the left in the Sept. 12 primary from former Secretary of State Matt Brown. If she wins, she’ll face the victor in the Republican primary, likely Cranston Mayor Allan Fung, who has raised $1 million, or his rival, state Rep. Patricia Morgan. Former state Rep. Joe Trillo, who was Trump’s state campaign chairman, is running as an independent and could act as a spoiler. Raimondo said she thinks her message about how she’s running to strengthen and sustain the state’s economic comeback is resonating. Raimondo is pushing a record of accomplishments, including an improving economy in a state whose economic fortunes have perpetually lagged its New England neighbors and the rest of the country, and her work to rebuild crumbling schools and her free college tuition program. TV ads unanswered from her opponents this summer note how many jobs have been created during her time in office, and tout programs she has pushed to attract businesses, spur hiring and train workers. Meanwhile, her campaign is running hundreds of Facebook ads, which get so specific that they mention roads that have been repaired in particular towns. “There’s more to do, but we’re heading in the right direction,” Raimondo says in one TV spot. Despite those accomplishments — and speculation nationally that she might run for president someday — her approval ratings have remained tepid. She has been criticized for failures of leadership as governor, including her 2016 decision to launch a computer system for state benefits such as food stamps, despite warnings from federal officials that it wasn’t ready. The resulting chaos left thousands without benefits, prompted lawsuits and a court-appointed overseer, who is still cleaning up the mess. A former venture capitalist, she’s still deeply disliked by many members of public employee unions because of her work as general treasurer to cut and make other changes to state pensions. She also invested hundreds of millions of dollars of pension money in hedge funds, a decision she made to reduce risk but which her successor backed away from because of huge fees. She won in 2014 with just under 41 percent in a three-way race, beating Fung, who got 36 percent. To some, Raimondo’s pension investments, huge fundraising numbers and tax incentives to corporations to lure them to Rhode Island have led to a perception that she’s looking out for corporate interests rather than those of everyday people. Kendra Anderson, 61, an environmental activist who voted for Raimondo in 2014, is backing Brown this year. She said Raimondo’s corporate connections have turned her off. A board member of the Rhode Island Progressive Democrats of America, Jennifer Siciliano, 48, of Warwick, said she was disillusioned by Raimondo’s cuts to Medicaid reimbursements and corporate tax incentive program. She’s voting for Brown in September and isn’t sure yet who she’ll back in November if Raimondo is on the ballot. “I don’t want to have to make that decision yet,” Siciliano said. Wendy Schiller, a professor at Brown University, thinks a lot of the dislike of Raimondo likely stems from her work to shake up the system. “She’s challenged the old guard. She’s challenged the longstanding distribution of patronage, distribution of benefits. 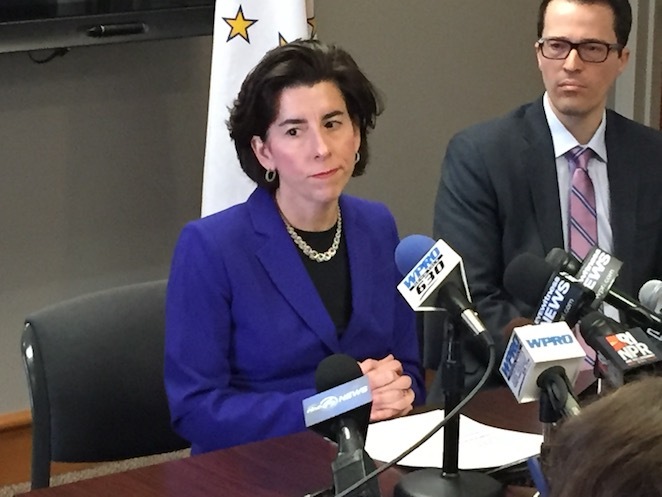 She’s pushing Rhode Island to change, and Rhode Islanders don’t like change,” Schiller said. While she doesn’t agree with Raimondo on everything, Democratic state Sen. Gayle Goldin said the governor has taken the right positions on progressive values she supports, including reproductive rights, mandating paid sick days and paid college tuition. “The governor has been up there alongside me on those issues,” Goldin said. Raimondo has her fans. During a recent visit to Pilgrim Senior Center in Warwick, the governor shook hands and highlighted face-to-face what she has been doing to improve the state. “We’re trying to get things going for people. Fix the roads, fix the schools,” she told Debbie Dion and her husband, Marcel, as they sat waiting for a Bingo game to start. “She’s helped a lot,” Dion said, adding that Raimondo has her vote. Schiller said it’s a tight race and Fung, a Trump supporter, has an “excellent” chance of winning. Fung has said little publicly during the campaign. He hasn’t put out any substantive policy proposals and hasn’t been giving interviews apart from conservative talk radio. Democrats who don’t like Raimondo will have a calculation to make in November, Schiller said.